They lost their a#* sure enough. It went on for several verses, which I no longer recall, but I’m sure you get the idea. And, NO, it wasn’t written by anyone who was any good at song writing. During the Q-Course (sometimes called S.F.Q.C.) the Land Navigation Exam was probably the single greatest factor in student attrition. It knocked out about half the guys we lost in Phase I—all by itself. The Land Nav section of Phase I lasted a week, during which we bivouacked in poncho hooches, in North Carolina’s Uwharrie National Forest, packing up our stuff every morning so we could run practice land navigation courses. We ran two each day—morning and afternoon—and one each night. Some guys, such as myself, tried to run each course. Others hiked over the first low ridge line, dropped their rucksacks and got some sleep. A fellow I won’t name, who became a good buddy of mine during the course, (unbeknownst to me during Phase I) used some of these opportunities to hike out to a specific intersection of dirt roads, where—at prearranged times—he’d meet a friend of his, who was scheduled to go through the next iteration of Phase I. That friend would bring him pizza and beer, a cheeseburger and shake or something similar, each time they met. It just kills me that I never came up with fun ideas like that! The Land Nav test would take place at the end of the week, then we would go back to Camp MacKall for Survival Training, followed by the Patrolling section—which culminated in a several-day patrol through the woods, coupled with raids and ambushes. of the paved roads still existed. We lived in tar-paper shacks. We lost a lot of guys before Land Nav week, of course, because the Q-Course wasn’t designed to test only a man’s physical strength and endurance, it also pushed him to his psychological limits. Guys went down to heat injuries, sprains or simple exhaustion, as you might expect. The Airfield at Camp MacKall. We parachuted in and out of Phase I.
And—surprising me at the time—some guys quit because they got mad. During those midnight calisthenics, for instance, the cadre would rotate out between exercises, which meant we students would be near exhaustion when a fresh instructor jumped in and started leading a new exercise, barking at us and calling us names if we had a hard time keeping up. There was a lot of complaint, particularly among guys who’d been through Ranger School, that this was unfair, that our instructors should match us exercise-for-exercise, or else they were cheating. Some of the complainers quit over things like this. In truth, this and other aspects of the course were designed to eliminate people who couldn’t handle emotional stress, which is often a critical factor in SF operations. It’s easy to conduct an operation in which everything goes right. But, when the rubber meets the road, things usually go wrong—often dangerously wrong. If a guy can’t handle the emotional stress of knowing how bad things are—can’t deal with how unfair his current situation feels—then the operation probably won’t succeed. You simply can’t get mad and throw in the towel, when you’re operating in a denied area—not only the mission, but also the life of every team member would be jeopardized. So we dealt with a lot of physical and emotional stress. But, some sections of the Q-Course, such as the Land Navigation Exam, also added a third component of difficulty: Mental Pressure. What our feet looked like BEFORE the test. Running resection or declination calculations, maintaining a pace count over long distance and constantly maintaining a comparison of the terrain around you to the map in your hand—all while working against the clock, fighting fatigue and the knowledge that you’re all alone in the middle of a vast, dark forest—can be a bit mentally taxing. Particularly when you were already pretty wiped out before starting the thing. The class was divided into groups of around 20, and each group was driven—in closed trucks so we couldn’t see where we were being taken—to some place in the Uwharrie National Forest. When the truck stopped, on a dirt road, we climbed out and followed an instructor back into the forest, where he had a small campsite set up. We dropped rucks and ate some dinner, then tried to sleep. Around 1:30 am, the instructor set off a grenade simulator to wake us. We packed our gear and gathered around him. He then read off the grid coordinates of the point we occupied. Each student plotted it on his map, then showed his map to the instructor. If the student got it wrong, the instructor didn’t tell him. Instead, his job was to note where the student thought he was, so finding him later might be a little easier. Additionally, the instructor would give each student the grid coordinate for the next point he had to find. Each student had a different grid coordinate, because the test is run alone. After plotting the new grid coordinate on his map, the student had to show it to the instructor—who would remain silent, of course; he just wanted to know where we thought we were going, so they’d have an easier time finding us if we got lost. After that, we were allowed to fill our canteens completely. Then, as we sat around waiting for the test to begin, the instructor read over the rules to us. We’d already heard the rules a dozen times, but regulations required that we hear them again, just before starting the test. The course begins at 2:00 am. No clear-lens light may be used at any time. Only a red-lens flashlight may be used. Anyone caught using a light source, with anything other than a red lens, is out! A red lens flashlight may ONLY be used when COMPLETELY STOPPED, to conduct a map check. It must be shut off before moving on. Anyone caught walking with a light on, is out! Each student must forge his own path through the terrain. No using roads, trails, bridges, or any other improved surface. Anyone caught using a road, trail, or bridge is out! Roads may be crossed at a 90-DEGREE ANGLE. OR, if a student can prove he was on azimuth, he may cross diagonally for up to a thirty-foot length of roadway. Anyone caught crossing a road diagonally, who cannot PROVE he was on azimuth, or who walks more than a thirty-foot length of roadway while crossing at a diagonal—for any reason—is out! A bridge may NEVER be used, for any reason. If the bridge crosses a water obstacle, such as a stream, lake, pond, river or swamp, you must enter the water obstacle from one bank, swim or wade with your equipment to the far bank and exit there. Anyone caught setting foot on a bridge is out! The courses run between 20 kms and 25 kms, therefore some students will have a longer course than others. You will not know how long your course is, until you have finished it. In order to complete the course, some students must find three points, while others must find four points. You will not know how many points you must find, until you reach your third point. The instructor at that point will give you your fourth point’s grid coordinates if you have one. BE ADVISED: The number of points has little to do with the distance covered while on the course. A student will only be given the grid coordinates of his very next point. When he arrives at that next point, he will then be given the grid coordinates of the following point, and so on. No speaking to anyone. A student may speak with an instructor, at the instructor’s point, ONLY TO VERIFY he has correctly copied the grid coordinates that the instructor has given him for his next point. Other than that—anyone caught speaking is out! Each student must carry a 35 lbs. pack, plus weapon and Load Bearing Equipment. Packs will be weighed before and after the course is run, to ensure compliance. To pass the exam, the student must complete his course by 10:00 am, in the prescribed manner, while carrying the prescribed load. Less than two minutes after the instructor was done reading, it hit two o’clock. As we set out from the starting point, each of us heading in a different direction, every man carried two quarters and a slip of paper with a phone number on it. We had instructions that, if completely lost, and we somehow stumbled across a payphone (they existed back then), we should call that number and the first words out of our mouths had to be, “Help. I am a lost Land Nav student.” We were also each issued one aerial flare, to signal for help in the event we became badly injured. Buoyed by these safety comforts, I set out through the pitch dark forest. There was no moon that night, which wouldn’t have mattered anyway, because the sky was overcast, cutting off any starlight. So, I walked forward with my head bent over my compass, which pulled the bill of my head gear (cap) down to protect my eyes. But, quickly tiring of bumping my head on tree branches I couldn’t see—even when looking directly at them!—I started to carry my free hand out a little ahead of me, as a sort of warning rod. I’ve always been the sort of guy who likes to help people. Heck, I was a Boy Scout; I promised to be “Helpful.” So, it wasn’t easy to ignore this guy, but I told myself I wasn’t here to help anyone, right now. 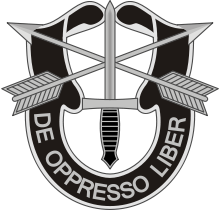 I was here to earn a Green Beret, and I had to obey the exam rules to do that. In a completely different voice, and very loud, I heard the first man bark: “I’m an instructor! Give me your score card. You’re out!” Now that he wasn't whispering, I recognized his voice and realized the man who’d been asking me for help, had been the company commander. Throughout the night, I occasionally heard screams, yells and accelerating vehicles as instructors gave chase to “Road Runners”—men who tried to make time by using the roads at night. And, the instructors weren’t dumb; they kept watch on known chokepoints in the area, using Night Vision Goggles to observe from the tree line, other instructors waiting nearby in hidden vehicles. The funny thing is, they told us, in advance, that they were going to do this. Still, the Road Runners tried. And they were caught by the boatload. I’ve spoken to a lot of guys who told me they got caught, but only a very few who told me they managed to get away. And, those few admitted: They didn’t even THINK of using a road for the rest of the test. I also saw a lot of flares climb into the night sky and burst overhead. We’d been told to ignore them, and let the instructors assist anyone in trouble. So, that’s what I did, but one of them was probably fired by my friend, Heise (pronounced like the fruit punch Hi-C, but with the inflection on the first syllable). Heise had walked into a tree branch in the dark. A twig on that branch had run up between his eye socket and eye ball. In immense pain, Heise couldn’t move. He was stuck, standing there in the middle of nowhere, impaled on a tree. Digging out his flare, he fired it, then waited interminably until he finally heard voices shouting in the woods. He shouted back, the instructors arrived, and they cut the twig from the tree, bandaged him up and ran him into the infirmary at Camp McKall. He was back, later that day, wearing an eye patch taped over his face. He passed the Land Nav retest, a week later, using only one eye. As for me, it took me all night to reach my first point. A desert native, I’d tried to follow a streambed up to the point—which does not work in the “wait-a-minute-vine” terrain of North Carolina. I made good time to my second point, reaching my third with about 45 minutes left in the test. The instructor gave me the grid coordinates for my fourth point (Yes, I was a four-pointer! ), and I set out. But, I never found it. I went right to it; I'm quite sure. But, it wasn’t there, I’d missed it somehow. I boxed and circled the area until time ran out. Then, I headed back to Land Nav Control, the little trailer the instructors used as an office, which sat beside our bivouac site. When I got there, I saw a group of about twenty angry men standing to one side. I turned in my card, telling the sergeant I hadn’t found my last point. He looked at my card, then told me to stand over with that group of angry men. When I got to them, they asked what point I couldn’t find. I gave them my grid coordinates and said I hadn’t been able to find my last point. “That’s because it wasn’t there!” shouted one of the guys. We’d have to go back to MacKall for Survival Training, then retest at the end of the week—running the whole thing over again. Most of those twenty guys quit, right then. The instructor asked us each, in turn, if we were staying or going. And, when he got to me, he looked like he hoped I would quit. Don't get the idea there was any pride in my voice when I said that. I was just stating a fact. It had been very difficult to wrangle my way over from Military Intelligence to Special Forces; I finally had to reenlist to do it. I wasn't about to jeopardize all that work, just because some bonehead had done something that was beyond my control. I was thinking: Why would I pack-up almost everything I own and put it in storage, leave my '65 Mustang at Ft. Campbell, KY, hop a plane for Fayetteville, NC with only a five-dollar bill in my pocket, then finagle a ride to Smoke Bomb Hill from a Special Warfare Lieutenant who just happened to be at the Fayetteville airport to pick up a visiting African officer (Thank God the Lt. wore his uniform, so I could recognize him, or I'd have had a long hike! )—if I were just going to quit over a stupid thing like this? An SF sergeant I knew, when I was studying Arabic at DLI, once told me: "EVERYTHING in the Q-Course is a test. Whether it intentionally is one, or not—EVERYTHING you meet out there is a TEST!" In my view, this was just one more example of that guy having been right. About a month later, having passed Phase I and returned to Smoke Bomb Hill in Fort Bragg, I saw those guys who’d quit over the Land Nav screw-up in Phase I. I was in the Engineer portion of my training (Phase II) at the time. They were cleaning out an empty barracks, things like that. As I walked past, they looked up and I looked back. There they were: guys who looked like a recruiting poster dream. And here I came, having passed—the guy the instructor had hoped would quit. Every one of them looked as if he was sorry he’d thrown in the towel. As things turned out, however, I had to run that test one more time before they gave me my beret. In Phase III, the last part of the Q-Course, in which students are formed into Student A-Teams and parachute into a field problem where they have to train and lead inexperienced soldiers, to conduct a successful guerrilla campaign, I had this crazy instructor (Literally; they were in the process of putting him out, a few months later, on what used to be called a “Section 8,” when he died in an automobile accident.) He claimed I’d gotten lost, at one point, during the Phase III field problem. On the other hand, he only passed two men on my 14-man Student A-Team, so the powers that be weren’t so sure his claim was valid. They couldn’t be sure it wasn’t valid, however, so … back I went for that Land Nav Test! This time, when the instructor handed me my score card at the beginning, he said, “We’ve got a special course laid-on—just for you, buddy! Enjoy…” The evil grin on his face was later explained, when I learned that I’d been given a course they never used anymore, because it was considered too difficult. But—though I had to swim Bones Fork Creek (which is actually a very deep swamp) TWICE!—I reached my third point with an hour and a half left on the clock. I waited. I knew the fourth point would be my last; they didn’t have courses with more than four points—at least, I hoped to GOD they didn’t! After a while, I looked up at him. Don’t quit when things look bleak. Resubmitting after rejection is almost never easy, but it’s the mark of a successful writer. Sometimes it takes a while to find your way. I’m no longer taking care of my dad; we’ve left that up to his hired helpers now. I’ve been finding my way through this change in my life at the same time that I’ve finally had the opportunity to find my way through writing the synopsis for my novel—which I completed about two years ago, just before my mother went into the hospital. I’ve got the first draft completed, and am working to make it sing. Today, I told you how I negotiated the Land Navigation Test. In two weeks, I’ll tell you how I’ve negotiated the previously unfamiliar terrain of synopsis writing. And, I’ll probably be asking for your own tips on the subject. Are you certain that's not a dead man's foot, Dixon? Can't wait to hear about synopsis-writing. Great post, Dixon. I could feel the branches. Great piece, Dix! I remember leading a land-nav team on a course in Ft. Bragg. Somehow we ended up knee-deep in a swamp. I feel certain I had a faulty compass--really no other explanation for it. Thanks, Terrance! Glad you enjoyed the story. David, I hate those broken compii. And those useless maps, too. Why, do you know: One time I grabbed a sapling beside me and shook it for all it was worth -- and not a single tree on that map moved at all!! Stupid map! Fran, I agree, those feet don't look good. LOL But, actually, I think that guy is pretty lucky. His feet got that white, waxy appearance from prolonged exposure to wet, and/or sweaty, boots. But, I only see one actual blister. During the first two weeks of month-long Phase I, I'd line up outside the infirmary, in the evening -- along with a couple hundred other men (we started Phase I w/ over 580 men, but finished, 4 wks later, w/ only 178) to get the blisters cut off our feet, then have a guy paint tincture of benzoine (SP?) on them. Thanks, anon. If you're who I think you are, I'll send you a copy if/when it comes out. Helluva deal. Glad you're with us. As my grandsons learned in TaeKwonDo: "Winners never quit, quitters never win. I'm a winner, not a quitter." Sounds like you learned that motto the hard way, and in fact, it's an ongoing life-long lesson. Wonderful stuff. I am a bad person, though. When you say in your caption that you parachuted in and out of that place I pictured a guy with the full kit on his back running very fast, flapping his arms, trying to parachute out. But that is just me. I wrote a novel synopsis last week. Looking forward to hearing how you did yours. This is awesome. I'm a Marine ROTC cadet and I was reading about Special Forces, the best article Ive seen on the intent and Ive looked a lot. I'm glad you liked it, Dylan. When I was in ROTC at Arizona State for a year, we had a Marine in our class, because there was no Marine-specific ROTC for him to attend. Don't make the same mistake I did: PAY ATTENTION IN YOUR OTHER CLASSES, TOO, AND DO YOUR HOMEWORK! If I'd followed that advice, I might have been an officer instead of an enlisted man. But, at 18, my other college classes just didn't seem important to me -- a very glaring error on my part.